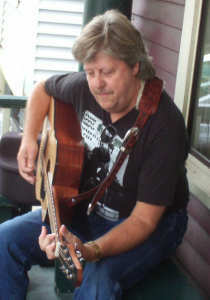 Chuck Swanagon teaches a variety of musical styles on both acoustic and electric guitar. He has been playing nearly fifty years, and has performed as an acoustic soloist, an electric lead guitarist, and a recording session player. Chuck was formerly a guitar instructor at Lapeer School of Music, before moving to Ann Arbor and becoming a guitar instructor, performance class instructor, and Music Program Coordinator at Herb David Guitar Studio.